Hugo&#39;s mama sends him to the store to buy soap. As a result of his comical adventures, soap is exactly what Hugo needs when he returns home. 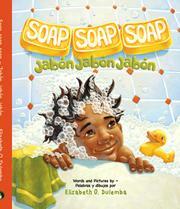 Dulemba, Elizabeth, “Soap, soap, soap Jabon, jabon, jabon,” Children's Picture Book Database at Miami University, accessed April 24, 2019, https://dlp.lib.miamioh.edu/picturebook/items/show/13504.